Two bodies were found inside a burned car in Barangay Balinsasayao in Abuyog, Leyte. 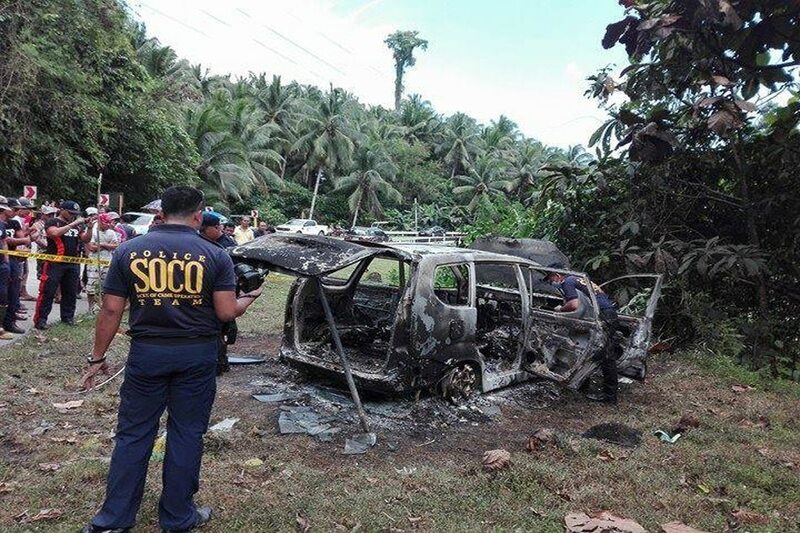 ABUYOG, Leyte — Two badly burnt bodies were found inside a scorched car along the highway in Sitio Taga-abaca, Barangay Balinsasayao here on Thursday morning. Police Chief Insp. Edwin Zata, assistant regional director of the Region 8 scene of the crime operatives, said his team will try to extract DNA from the bodies in the hopes of identifying the victims. Authorities will coordinate with the Land Transportation Office and Highway Patrol Group to retrieve the vehicle chassis number and help track down the car owner. Mario Alcober, a resident of Sitio Lourdes in the same barangay, said he heard 3 loud explosions from the nearby sitio around 2 a.m. He thought it was connected to road repairs. Police said the explosions might be connected to the burning car. Authorities are still investigating whether there was foul play involved.